Does your Google+ profile have more followers than your brand page? Welcome to reality. 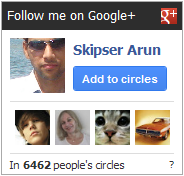 Google+ brand pages have worked out only for the big boys who already have a huge loyal follower pack. Most mid/small sized publishers like you are stuck with very little followers for your brand pages!!!!! So why wait endlessly for your Google+ page to catch attention when you can easily build up on your Google+ profile? Sounds good, but Google doesn't allow a badge for my profile!!! Gplus Badge is the perfect alternative for you!!!! It can be used both for your profile as well as a Google+ page. Running in more than 100+ websites. Gplus badge is not restricted to Google+ pages. It works for profiles as well. Gplus badge can show your profile image. The official Google+ badge can't. Gplus badge can show the dynamic "Add to Circles" button for pages, so people can add your page to their circles without leaving your site. Just like the official Google+ badge. Gplus badge shows the number of your followers on Google+. The official Google+ badge can't. 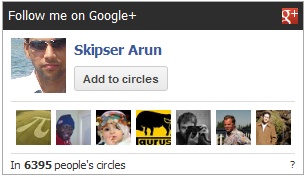 Gplus badge can show images of people who have added you to your circles. Gplus badge can show a +1 button for the website as well. Gplus badge is fully customisable. You can choose which information to show or hide (size, header, follower images, +1 button, background colors, border colors, text colors and much more). 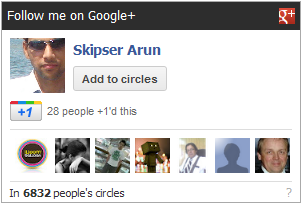 Looks much better than the official Google+ badge, fits better to any website theme and can bring in more followers. You can install Gplus Badge in three simple steps. First download an extract the contents of the zip file. Unzipping will give you a directory called "gplus-badge". Copy this directory to any location in your webserver. In your web page, add this code where you want the badge to appear. You can further customise the badge with these additional parameters. Here are some sample images for different customisations. Full badge with +1 button. Full badge without +1 button. Full badge with a red "Add to circles" button without header. Small badge without follower images, +1 button and header. Full badge with smaller width.